Habitat : An evergreen tree originating in southern china, and widely cultivated there and elsewhere southern and eastern asia. Uses : Cassia is used in traditional Chinese or Indian medicine, where it is considered one of the 50 fundamental herbs. 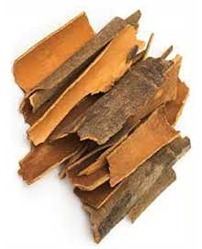 Cassia bark (both powdered and in whole, or "stick" form) is used as a flavouring agent for confectionery, desserts, pastries, and meat; it is specified in many curry recipes, where Ceylon cinnamon is less suitable. It is be used for erectile dysfunction (ED), hernia, bed-wetting, joint conditions, menopausal symptoms, menstrual problems, and to cause abortions. Bark oil have been used either as flavors or as carminative, stomachic, tonic, or counterirritants in pharmaceutical and cosmetic preparations, including liniments, suntan lotions, nasal sprays, mouthwashes or gargles, and toothpaste, among others.